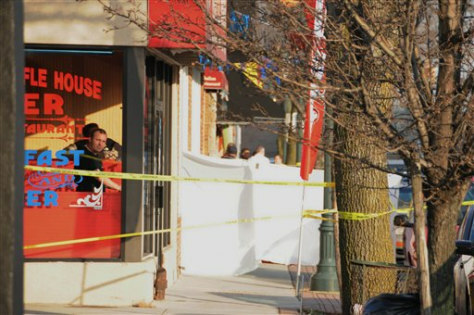 A sheet stretched across a sidewalk obscures the body of a man who was shot and killed after robbing Charlie’s Family Pharmacy in Seaford, N.Y., Saturday, Dec. 31, 2011. Nassau County police said the unidentified man entered the pharmacy and announced a robbery, then exited with cash and drugs. Three people intervened as the man left the shop, police said. Killed during the confusion was 51-year-old John Capano, a 23-year veteran of the Bureau of Alcohol, Tobacco, Firearms and Explosives.